The Champion range of sheds is known for its high quality and great looks and the 8′ x 6′ Shed-Plus Champion Heavy Duty Apex Single Door Shed is one of the very best that the line has to offer. 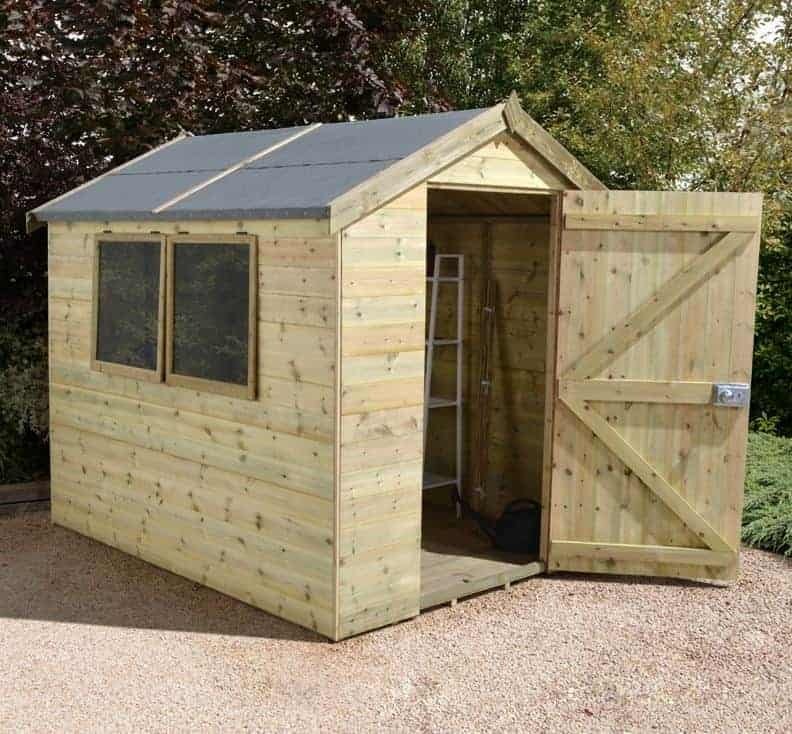 Giving you plenty of storage space to make use of and more than enough headroom to walk around comfortably, this is a shed where you will enjoy spending your time, working, doing DIY or even just organising your belongings. A large door will make putting your things in here very easy and those two large, toughened glass windows will allow not only plenty of natural light inside, but some fresh air also. This is one incredible looking shed that would be a highlight in any garden and thanks to the way it has been designed will be with you for a long time. Obviously this is one very good looking shed, but the Champion name on it also means it is made from the finest materials. 12 mm tongue and groove cladding that has been pressure treated is going to last for many years and keep everything inside safe from bad weather. A solid, cross brace supported frame is what makes this such a strong and reliable shed which along with the high quality floor and roof make this one very robust structure. 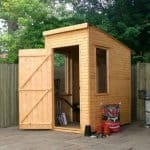 Shed-Plus have been releasing a number of high quality and just generally great looking sheds lately and the 8′ x 6′ Shed-Plus Champion Heavy Duty Apex Single Door Shed is another one we are very happy to take a look at. 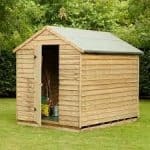 We feel that this is a very good sized shed for most gardens as it offers you an ideal amount of storage space, but without taking over the whole of your garden. There is 7 feet 11 inches of room in the depth and then 6 feet of width, giving you rather quite a lot of floor space to use. The headroom offered here is fantastic with a ridge height of 7 feet 3 inches, you will find pottering around inside here will not see you having to be hunched over all the time. Even people who are very tall will not have any issues walking around inside the shed. Shed-Plus love to have an apex roof on their sheds and we consider them to be one of the very best at making great use of it. They always make it nice and high to really make sure the rain runs straight off as well as giving you all of that headroom. The roof is made with tongue and groove boards which are 12 mm thick and covered with 20 kg mineral felt for protection. We are more than happy with the roof here and feel that it will stay strong for many years. The cladding is 12 mm thick tongue and groove cladding which is the same as we just talked about with the roof. 12 mm is a very good size and the high quality wood that has been selected gives the shed not only a very stylish look, but also a very strong feel when you touch it. The design used here will not allow water to get inside so anything you store will be very well protected. 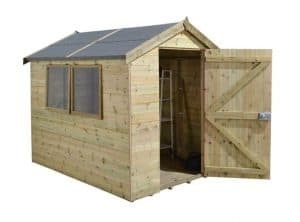 Even from the pictures this is a shed that has a very robust look to it and we can assure you it is even more impressive when you are standing right in front of it. We really could not be any more impressed with the frame on the Shed-Plus Champion line of sheds. 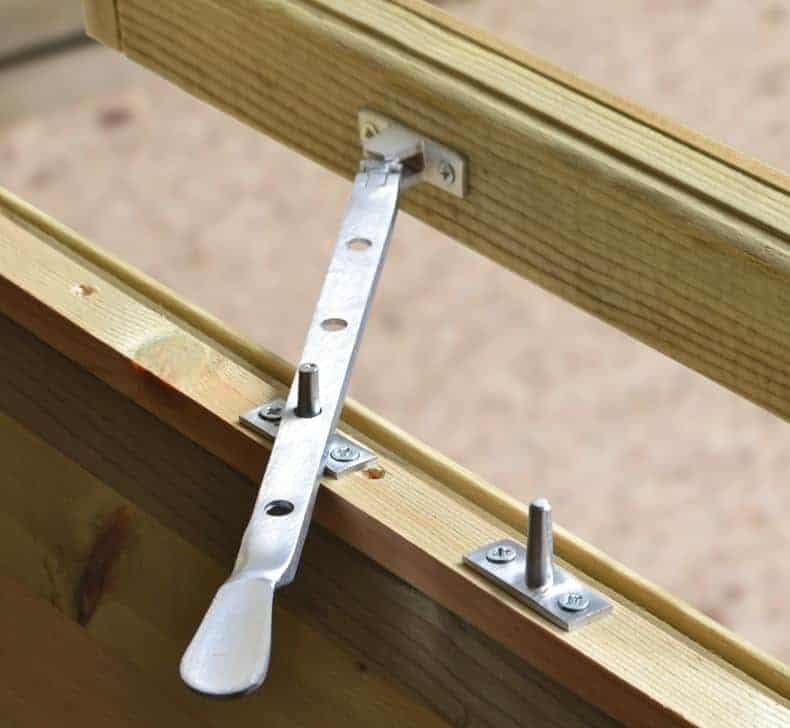 They use a 34 mm x 34 mm frame which is a big part of what makes this so solid, but also the frame is supported with heavy duty cross braces to really make sure that it stays strong and is up to the job of lasting you many years. The 12 mm tongue and groove floor will allow you to not only keep heavy things stored inside of here, but also make it so you are not scared to walk around as the floor can easily take your weight. While the boards are strong, we have to tell you about the reinforced floor joists underneath which really give the floor a great deal of extra strength. 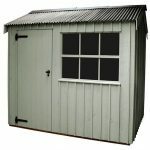 All sheds in the Champion range are pressure treated to ensure a long lasting life. Still you will want to give the shed a coating of wood treatment once you have built it and then do the same on an annual basis to help the shed stay looking fantastic. The extensive pressure treatment process that Shed-Plus put the timber through allows them to offer an incredible 15 year warranty with the shed. Standing at 5 feet 11 inches high and 2 feet 11 inches wide, considering this is only a single door, you do actually have a lot of room to get things in and out of the shed. As you can see from the pictures the door has a traditional door knob and lock for ease of access. Very strong door hinges are used to keep the door in place and their silver design goes very well with the door knob and lock. The 8′ x 6′ Shed-Plus Champion Heavy Duty Apex Single Door Shed has two large windows. When building the shed, you can actually decide which side of the shed you have these on which is always something we like to see. Just from the pictures you can tell these are good sized windows and they are also very strong as they are made with toughened glass. Each window can be opened so you can allow plenty of fresh air in here on a stuffy summer’s day. 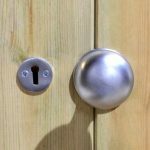 The lock that is included with the shed is more than reliable enough to keep your items safe at night and when you are away from home. The whole structure actually has a very strong and safe kind of feel to it so we are sure you will never have any security concerns as long as you remember to keep it locked up. 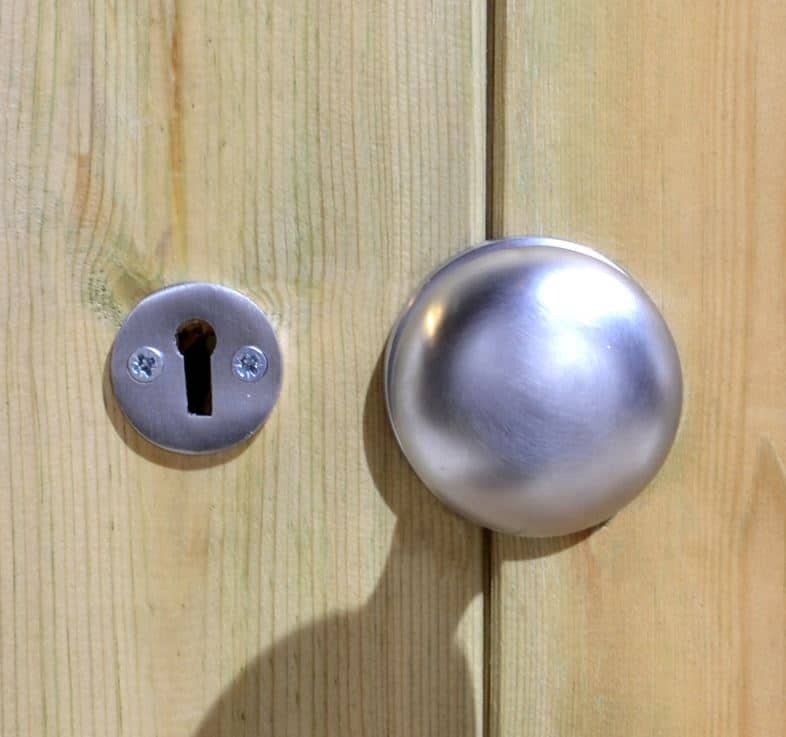 To add some extra security it would not be all that expensive or time consuming to add an extra pad bolt to the door. This is a very open style of shed and with those two large windows it is very easy to see what is inside. Adding some blinds or curtains would address this, but then you would maybe not be able to open them as easily. We love the way the shed has been designed and honestly we do not think we would change one thing about the way it looks. Still if you like your things to all look the same, by using some coloured wood treatment, you would be able to make the colour of the shed fit in with the rest of your garden. You get all you need when the shed is delivered, but one thing that is offered is a Champion Workbench. 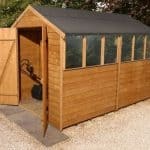 This is made in the same style as the shed and is available for an extra, £84.99. Shed-Plus do not call this their Champion shed for nothing. This is made with very high quality materials and we are actually pretty surprised they are able to keep the price as low as it is. The pressure treated timber that makes up the shed is just incredible. If you are sure to give the shed a coating of wood treatment once a year then there is no reason as to why this is not going to last you for a couple of decades at least. We feel that the space offered by this shed is very reasonable and with some good planning on your part can really be used well. 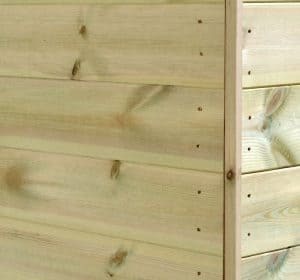 You will need another person to help you build this and it is going to take a few hours, but we feel this is a shed that deserves to be built right so take notice of the instructions and try not to rush it. 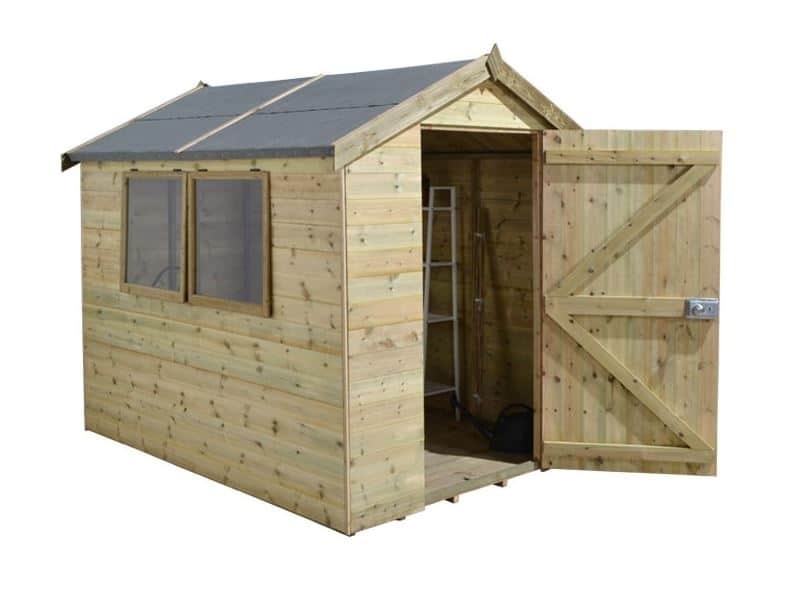 It may be over £500, but we still feel this is a good value for money type of shed. It manages to look very appealing, but thanks to the pressure treated timber is also going to last you as long as you need it to. Final Thoughts: Even from the pictures alone we are sure you can see how amazing the 8' x 6' Shed-Plus Champion Heavy Duty Apex Single Door Shed is. We are very impressed with how high quality the Champion line of sheds is as everything about them has been selected because of how long lasting it is. 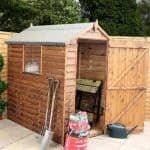 We are sure that this is a shed which could actually be the only shed you ever need to buy as long as you look after it in the right way. We are more than happy to recommend this shed to anyone looking for good looking, long lasting place to keep their belongings safe.